Our chapter also received a SE Region Chapter Achievement Award. Both chefs, Rodrigo Nunez and Christian Markussen, move on to represent our Region and compete at the 2015 ACF National Convention. Good luck, chefs! Speaking of the upcoming ACF National Convention, you are invited to participate in the 2015 American Culinary Classic. This competition is open to international culinary teams, regional, city, college, company, military teams and individuals from the United States. 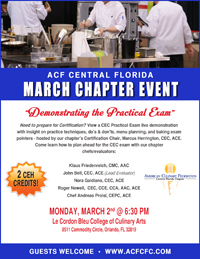 This event will take place during the 2015 ACF National Convention & Show, July 30-Aug 3, 2015, at the Orlando World Center Marriott, Orlando, Florida. For more information please click here. Deadline to register is March 30th. Need to prepare for Certification? Don’t miss our next chapter meeting event! Bonus: Earn 2 CEH credits!